I just got back from SPX. I had a wonderful time, and got to talk to a lot of talented cartoonists. The event is huge now and there was an amazing variety of work on display. 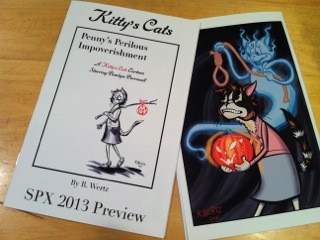 I was handing out a revised version of my Kitty’s Cats preview mini-comic. It included 12 complete pages of the story and a full color cover. If you are visiting this site as a result of receiving the preview, welcome! I would also like to thank any of you who took the time to talk to me at the Expo. It really helped to remind me why I love comics, and the small press community. As stated in the new preview, I plan to start posting new comics on Halloween this year. I look forward to finally finishing Penny’s first story. I hope you will come along for the ride!